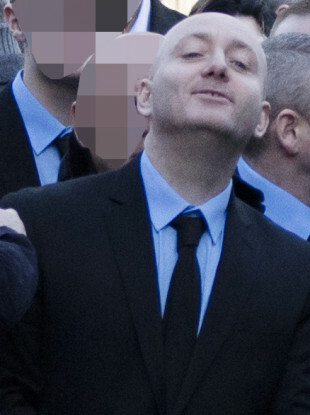 Freddie Thompson at the funeral of Regency Hotel shooting victim David Byrne. CONVICTED MURDERER FREDDIE Thompson has been moved into protective custody. Thompson, who was last month imprisoned for life for the Kinahan feud murder of Daithí Douglas, has become involved in a row with another convicted killer. Tensions in Portlaoise have heightened since Thompson’s arrival. There are only around a dozen prisoners in the high security facility. On one morning in the last week in Mountjoy, where Thompson was held on remand during his trial, around 40 inmates confronted each other in what has been described as a standoff by sources. Although no physical violence occured, officers have been treating it as a serious incident because of the identity of those involved. The men involved in the incident are linked to Thompson. A number of knives, similar to switchblades have been found on the Dublin campus in recent time. Some of them were discovered in the exercise yard where many Kinahan-linked gangland figures congregate during out-of-cell hours. It is believed that these knives were to be delivered to Kinahan criminals in a bid to control the inmates who share their landings. During Thompson’s trial, the non-jury court heard that Daithí Douglas was shot six times shortly as he took a meal break at the counter in his partner’s shop. A semi-automatic pistol with its serial number removed was found next to his head. Justice Tony Hunt said there is no doubt that Douglas was murdered and that this was an execution involving intricate advanced planning and co-ordination. He pointed out that the prosecution did not suggest that Thompson was the person who fired the shots, but that he was one of the people involved. Specifically, Thompson had been driving a Ford Fiesta that was intricately involved in the murder plot. The Fiesta was seen interacting with other vehicles and individuals involved in the plot on the morning before the shooting. It also drove past Shoestown four minutes before the shooting, in what Justice Hunt said was a “final check” before the gunman arrived to carry out the planned execution. Douglas’s murder was one of the 15 directly linked to the Kinahan/Hutch feud. His murder. A week prior to his death, Gareth Hutch was shot dead as he walked to his car in Dublin’s north inner city. A month after Douglas’s death, innocent Dublin council worker Trevor O’Neill was shot dead as he holidayed in Spain. The gunman mistook him for a senior Hutch family member. Email “Freddie Thompson moved to protective custody after row with another killer”. Feedback on “Freddie Thompson moved to protective custody after row with another killer”.